Cardiff Marble expects the Proliner to again help improve their production process! Home Prodim Noticias Cardiff Marble expects the Proliner to again help improve their production process! Originally established in 1938, Cardiff Marble Company, is the leading provider of Granite, Quartz and Marble work surfaces in Wales (UK). Their portfolio covers all aspects of stone including flooring, cladding, fireplaces, staircases, bathrooms and work surfaces. Cardiff Marble uses a Proliner 8CS with Proliner CT for digital templating. 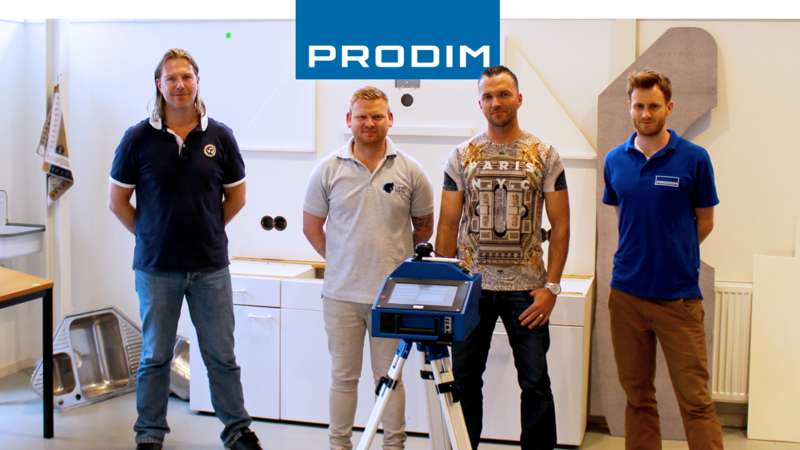 Joseph Ilse from Cardiff Marble: «We use the Proliner mostly for measuring kitchen countertops on-site and wooden templates that are send to us. But we also use it for projects like the renovation of Cardiff Castle for which all measurements where done with the Proliner. When we started using the Proliner years ago it improved our entire production process. Measuring wooden molds with the Proliner is much faster than scanning it with our ‘old’ X-Y axis CNC saw and of course the Proliner provided the ability to go measure on-site.